Eyeglasses have been a solution for correcting vision problems for several centuries. When contact lenses arrived on the scene, they provided a new solution for restoring vision that was more convenient and less cumbersome. Today, an increasing number of eye surgery options mean that glasses or contacts are no longer the only solutions for healthy vision. Advanced technology has made it possible to reshape parts of the eyes and restore vision to healthy levels for people from all walks of life. Over the past twenty years or so, surgical techniques and tools have evolved to rapidly create procedures that are both safe and helpful. Corrective surgeries for the eyes now include everything from the use of lasers to reshape the cornea surface to the insertion of artificial lenses. These procedures correct how light entering the eye is processed, resulting in much sharper vision in patients. The state of the cornea is a determining factor in many of these surgeries. For example, thinner corneas with a high degree of myopia usually require a more invasive procedure to reshape the eye surface enough to improve vision. Laser correction surgeries provide a snapshot of evolution in eye surgeries. Photorefractive Keratectomy (PRK) was the first surgery to successfully change the shape of the cornea by removing tissue. The FDA approved PRK in 1995 and it is still widely used even in the second decade of the 21st century. With PRK, it only takes a few days for vision improvements to be realized. LASIK followed fast on the heels of PRK. It involves cutting a thin flap in the outer covering of the eye to reshape the cornea. It only takes a few hours to gain sharper vision with LASIK surgery, a huge advance over PRK. Before the flap fully heals, there is some risk of suffering dry eye and other complications such as halos around bright lights. 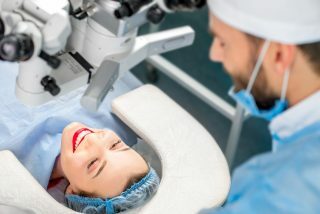 LASIK can be done in different ways, including with the aid of a mechanical cutting tool, using all lasers or incorporating wavefront technology that measures how light hits the eye. Nearsighted patients are not alone in benefiting from technological advances. Farsightedness can be corrected through Conductive Keratoplasty (CK). It uses a small probe and low heat radio waves to create spots around the cornea periphery. CK steepens the cornea to give patients better near vision. Some eye surgeries involve implanting new artificial lenses to produce vision improvements. Implantable lenses similar to contact lenses can correct more severe levels of nearsightedness. These artificial lenses are placed permanently over the natural lens on the eye. Refractive Lens Exchange (RLE) takes it a step further and replaces the natural lens with an artificial lens of a different shape. RLE is done to correct extreme farsightedness. Some corrective surgeries are not a good option for everyone due to the changes our eyes undergo as we age. People under 18, for example, are not good candidates for laser eye surgeries because their eyes change rapidly as their bodies are growing.